Bushnell has become a leader in the growing Trail Camera industry, making it easier than ever to monitor the wildlife on your hunting grounds. This HD Trophy Cam allows you to have your own personal "all seeing eye", on your property. Monitor your potential hunting grounds during the preseason, to get a pulse on what type of game is present, so you can spend less time tracking and more time hunting! Capture trespassers, backyard pest, or wildlife in full color 720p high definition video and 8 megapixel stills, day or night, with the integrated 32 LED light. 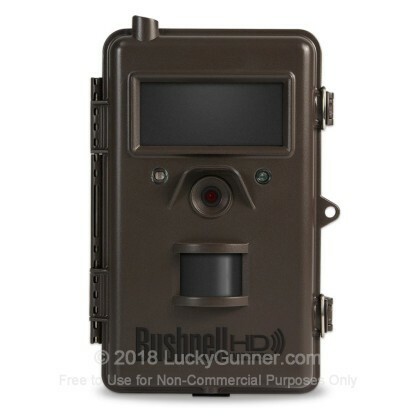 Featuring a weather proof construction, 1 year battery life, interval time lapse mode and motion activated sensor (out to 60 feet), this trail camera has everything needed for nearly any situation. Stop wondering what's out there... Capture it in High Definition with Bushnell's Trophy Cam HD!